New lucky board from NK for a lovely outfit. Board changes every 6 mins with wildcards. Goodluck. New lucky board at SugarCoat for some red wings. Board changes every 10 mins with wildcards. Goodluck. From Lucky Chair, Group Gifts, Freebies, to Dollarbies.. The best thing I can do is tell you what is here, and the Landmark sends you to the entrance to the store. 1. Top floor, there is a vendor on the wall that has boots, tennis shoes, flats for sale for 1L until end of the month. 2. First floor entrance, has a group gift of Ghost Busters and Halloween Dollarbies all in the center of it, I only showed you a sample. 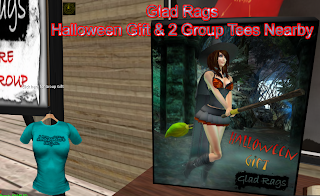 Behind it on the same floor by the group invite is a Halloween Gift of a Witches Costume. Don't forget to get a bite of the Lucky Cupcake or click on the Subscriber! 3. Bottom floor, has a lucky chair, dollarbie eye tattoos, and a dollarbie ridable scooter. 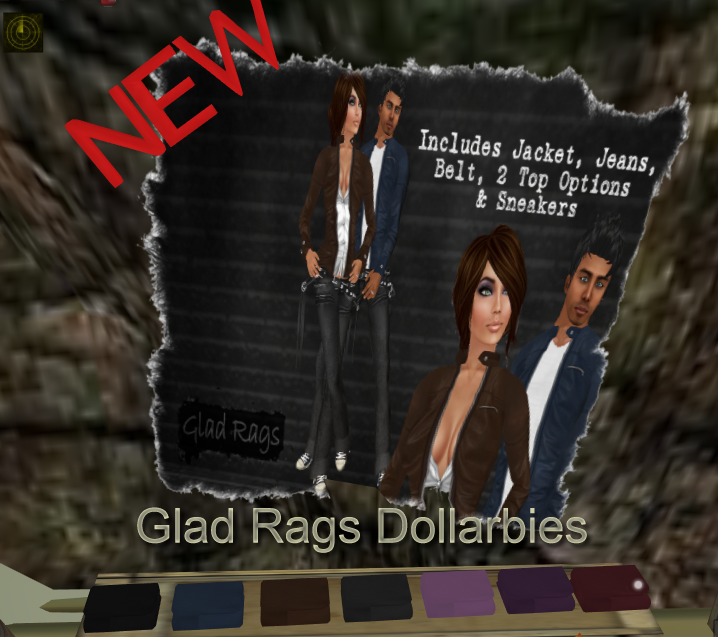 There is a NEW Rider outfit (Unisex) nearby in different colors as well for 1L. 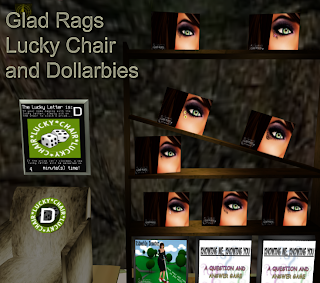 2 new group lucky boards at Silly Girl Market, group inviter nearby, for hairstyles. Boards change every 15 mins with wildcards. Goodluck. New lucky board at Saru Ramen Honten for mini monkey avatars, which are trans. Board changes every 5 mins with wildcards and rotates through all the colors shown. Goodluck. I cannot stress how awesome this event was. My friend Jezebel pointed it out and I can't thank her enough. XD It's mostly just for fun but you can hunt out some prizes too. "The Tower of Fears is now open at Rendervisions Isle, home of the Art Door Group, where the BB was inspired and born. RL Artists and Game Specialists show off their amazing scripting & artistry skills in this famous event that changes each year. THIS IS NOT your ordinary haunted house in SL! It's also part game, as you find amazing goodies in Bio Bags, Find cards, keys, clues and secret doorways. Jump, run and swing to save yourself from peril. And did I mention we're gonna be live actors too?" Thankies to my friend Midori for pointing this out to me. ^^ Cute lil TukTuk vehicle in the lucky or unlucky chairs near the entrance at HaruMotors. Both chairs change every 2 mins or so, with wildcards. Also group gift out front too. Goodluck. Group lucky board at Little Cat for a mini yukata. Group inviter nearby, and board changes every 15 mins with wildcards. Goodluck. New lucky board at Lemon's Guitar for a Soprano Ukelele. Board changes every 10 mins with wildcards. Goodluck. New lucky board at Kakato for a curry hat and curry mask. Board changes every 10 mins. Goodluck. New lucky board at Suzume for a cute lil japanese house/skybox. Board changes every 5 mins with wildcards, also some nicely priced goods in the shop too. Goodluck. New lucky board at Aquarea for a big halloween hat. Board changes every 10 mins with wildcards. Goodluck. New lucky boards for female skins at Mother Goose for the eliza skin. Board changes every 5 mins with wildcards. Tons of past lucky boards as well. Goodluck. Newish lucky board for Bread related goods. Board changes every 10 mins with wildcards, also a neat gacha nearby. Goodluck. New lucky board at Breathing for elven ears with piercings. Board changes every 10 mins with wildcards. Goodluck. New lucky board at JGS for some onigiri (japanese rice balls). Board changes every 10 mins with wildcards, and other goodies nearby. Goodluck.